Florence March is Professor in Early Modern English Drama at University Paul-Valéry Montpellier (France) and a member of the Institute for Research on the Renaissance, the Neo-Classical Age and the Enlightenment, at the French National Centre for Scientific Research (IRCL). She has published extensively on Shakespeare’s function in South France festivals (Avignon, Montpellier and Nice), on Shakespearean stage configurations in 20th and 21st century Europe and the relationship between stage and audience, as well as on Restoration drama. 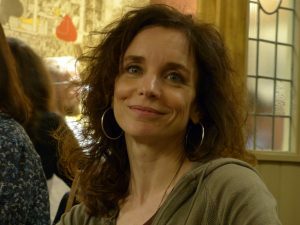 She is co-editor-in-chief of the international journal Cahiers Élisabéthains (Sage), and associate editor of ASF, Arrêt sur scène/Scene Focus, a bilingual online journal in performance studies. She is a translator of drama in English at Maison Antoine Vitez (an International Centre for drama translation). She is a member of the European Programme (2016-2019): “New Faces: Facing Europe in Crisis: Shakespeare’s World and Present Challenges”. Florence March will co-supervise one MOVES research project: “’Clash of Cultures’? A Case Study and a Critique”.